от 3 шт. — 495 руб. от 30 шт. — 493 руб. Добавить в корзину 1 шт. на сумму 530 руб. 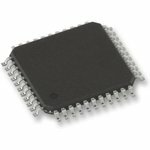 The EPM7064STC44-10N is a high-density, high-performance Programmable Logic Device (PLD) based on second-generation MAX® architecture. Fabricated with advanced CMOS technology, the EEPROM-based MAX 7000 family provides 600 to 5000 usable gates, ISP, pin-to-pin delays as fast as 5ns and counter speeds of up to 175.4MHz. Additional design entry and simulation support provided by EDIF 2 0 0 and 3 0 0 netlist files, library of parameterized modules (LPM), Verilog HDL, VHDL and other interfaces to popular EDA tools from manufacturers such as Cadence, Exemplar Logic, Mentor Graphics, OrCAD, Synopsys and VeriBest.